The Purescape 040 has been created with an infinity pool inspired design, with an overflow positioned inside the rim of the tub providing bathers the benefit of full body soaks with maximum water capacity, allowing for overflowing at the rims. Purescape 040 is crafted with an ergonomic interior which molds to the human form and provides ultimate bathing comfort. Featuring a refined rectangular shape suited for any bathroom project. 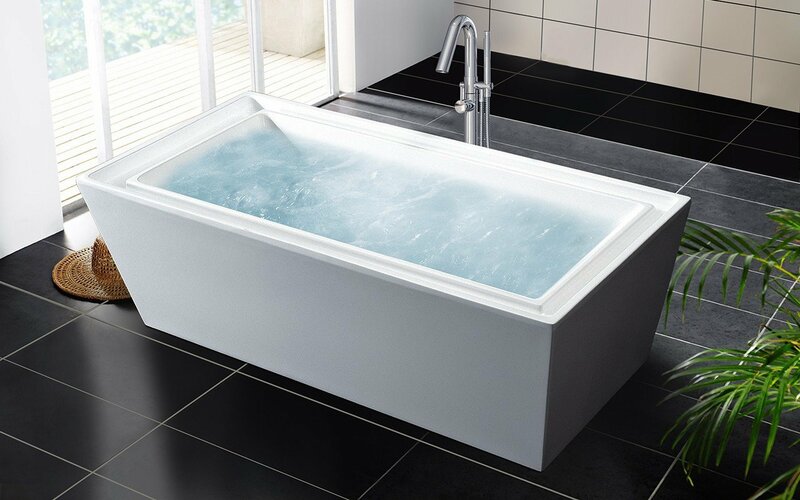 The premium acrylic material used by Aquatica from Lucite International provides this tub with thick walls, excellent heat retention and durability. This unique bathtub has taken its lead from the Infinity pool concept to enable the user to maximize their bathing experience. Here, you fill the bath to the very top – a full 17” (43 cm) and water can overflow into the specially designed rim. 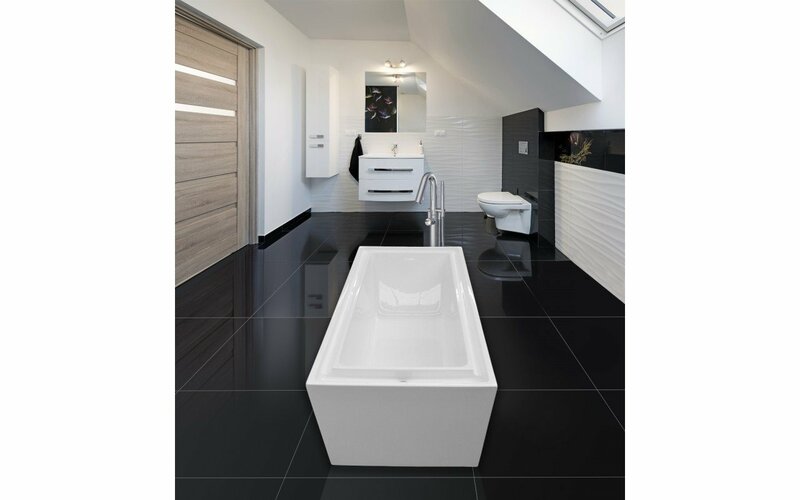 The bath also features a more acutely angled wall to allow more reclined back and neck rest support. 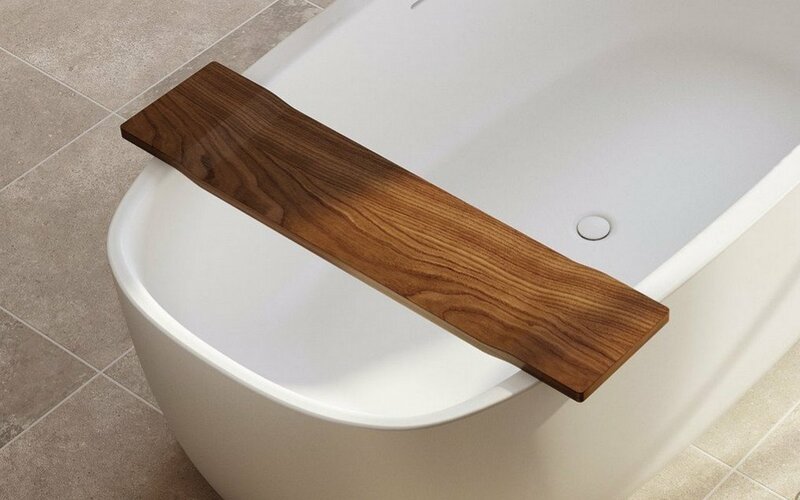 A stunning take on the traditional bathtub tray, this new bathtub tray incorporates the rich, warm tones of pure, solid, natural Iroko wood crafted in a very modern, uber chic design that exudes style. This is the ideal accessory for most of Aquatica's bathtubs, as it reflects the same interpretation of function in cleverly designed and beautifully rendered form. We purchased the Aquatica PureScape™ 040 Freestanding Acrylic Bathtub for a client's home because she wanted a true deep-water tub. This was the answer and she is thrilled with it. The service was great. Goran was responsive, patient and helpful. It seemed almost too good to be true that shipping would be free and then arrive in good condition & on time also. No worries were necessary there! The packaging was impressive - very secure & sturdy. Delivery was well done - driver did a good job. Overall, very pleased with this company & the bathtub. Yes, I would recommend and purchase from again. Heavenly Infinity Pool Spa Experience! This tub was exactly what I was looking for. Well-made, with clean contemporary lines. Love the channel around the top edges for the drain...perfect for soaking up to my neck and submerging almost completely in an infinity pool- like experience. Big enough for two people, even. My husband loves that he can lie back comfortably on the slanted end (opposite of the drain), and still be able to stretch his legs out most of the way with his knees submerged (he's almost 6'). We ended up getting a ceiling tub filler, rather than a freestanding floor or wall spout, and the effect is amazing. A big hit! The PureScape 040 is very modern and elegant. If you want luxury, then this is it. The material feels so smooth and comfortable, I would not have guessed it was acrylic.